Select the data field where the stored value should be saved. 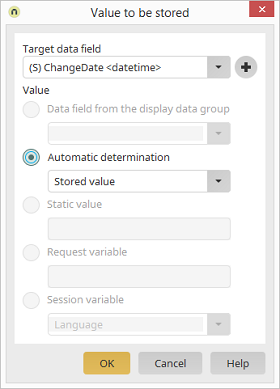 Values can come from a "Data field from the display data group", meaning the data group that you linked to in the data source configuration. Create new data field, Opens a dialog where a new data field can be created. The stored value will be taken from the field from the Data source tab. With this setting, a fixed value can be entered that is stored in the target data field every time a data set is saved. Enables the entry of a value from a request variable whose name you enter here. Even a value from a session variable, e.g. the language setting, can be used as the value for the target data field. Select the session variable from the drop-down list.